There is a dangerous appliance lurking in my kitchen. It’s not the serrated knives. Or the super-sharp food processor blade. Or the pressure canner. Don’t let the rounded edges and sleep appearance fool you. This little machine is responsible for more losses of willpower than any other item in the entire kitchen. 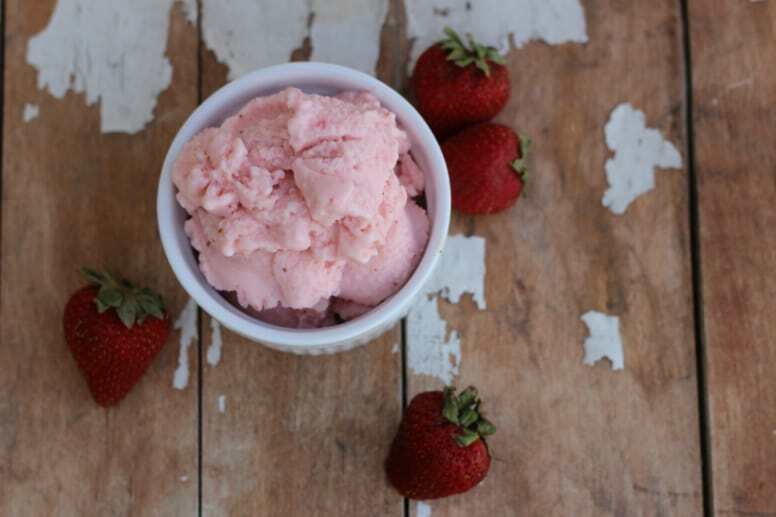 It makes whipping up a batch of homemade ice cream WAY TOO EASY. If I wanted to make ice cream in the past, I had to make sure I had plenty of ice (which I never did), and also plenty of salt (which I never did). Inconvenient? Yes, but at least it kept the ice-cream eating at a minimum. But not any more. Now I’m only 25 minutes away from ice cream at any moment in time. And that, my friends, is highly dangerous. 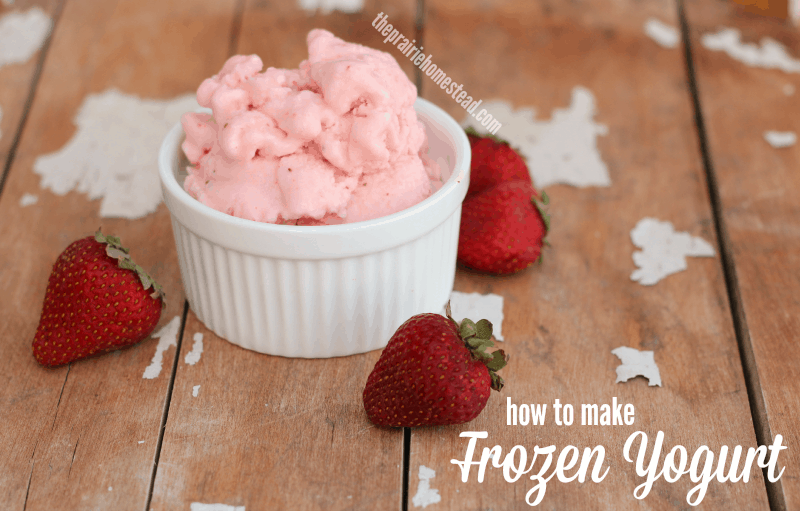 I also recently discovered that it makes a knock-your-socks-off frozen yogurt recipe. So, like any rational person would do, I proceeded to make three separate batches in a 48 hour period. All for the sake of the blog. Of course. 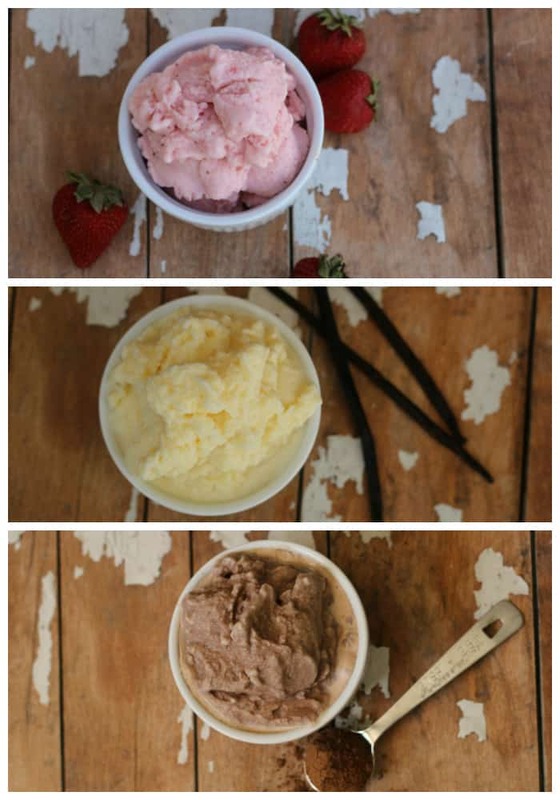 And because I love you guys, I’ve included recipes for all three variations of frozen yogurt in today’s post. You’re welcome. 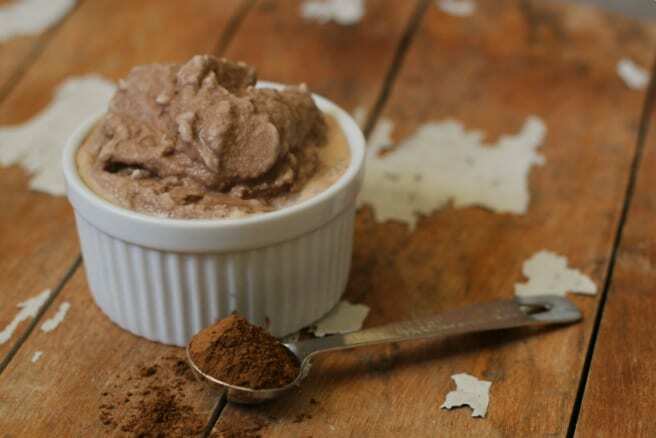 Use a stand blender or an immersion blender to combine all four ingredients until the sugar and cocoa is thoroughly dissolved. Use a stand blender or an immersion blender to combine all three ingredients until the honey is thoroughly mixed in. Taste the frozen yogurt mixture, and adjust the sweetness, if needed. 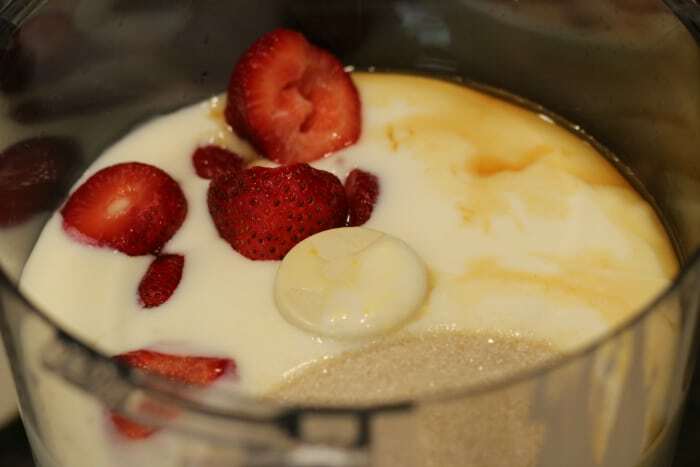 Use a stand blender or an immersion blender to combine all four ingredients until the strawberries are pulverized. I initially used my food processor for this, but a blender would have been much easier. 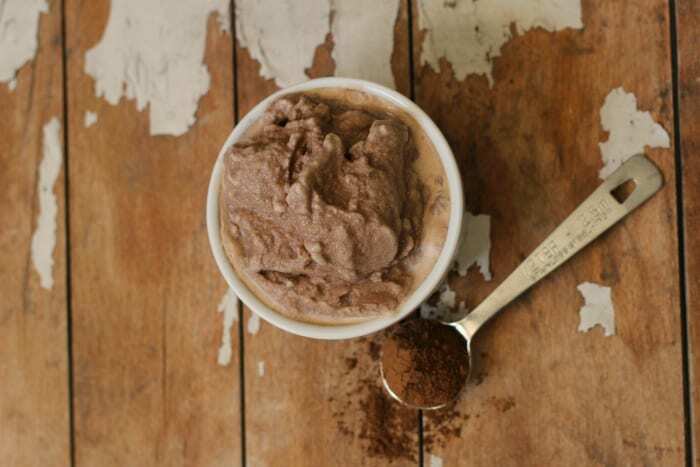 Pour the mixture into your ice cream maker, and freeze according to manufacturer’s recommendations. 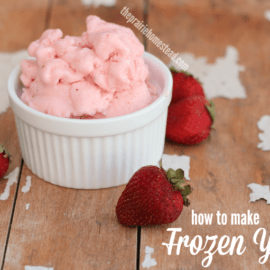 This frozen yogurt recipe is best eaten right away, but you can also pop it into the freezer for later if you like. Simply remove it from the freezer 20 minutes before you plan to eat it to allow it to soften. Don’t you just love it when you have to make multiple batches of something yummy for the sake of the blog? I don’t have an ice cream maker, but if I did, I would probably make frozen yogurt on a daily basis. Enjoy! Thank you for these recipes! 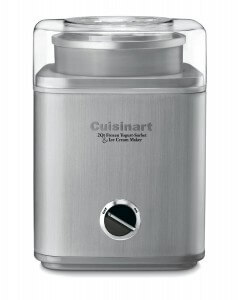 My 12 year old daughter received one of these ice cream machines for the holidays because she is an ice cream fanatic! 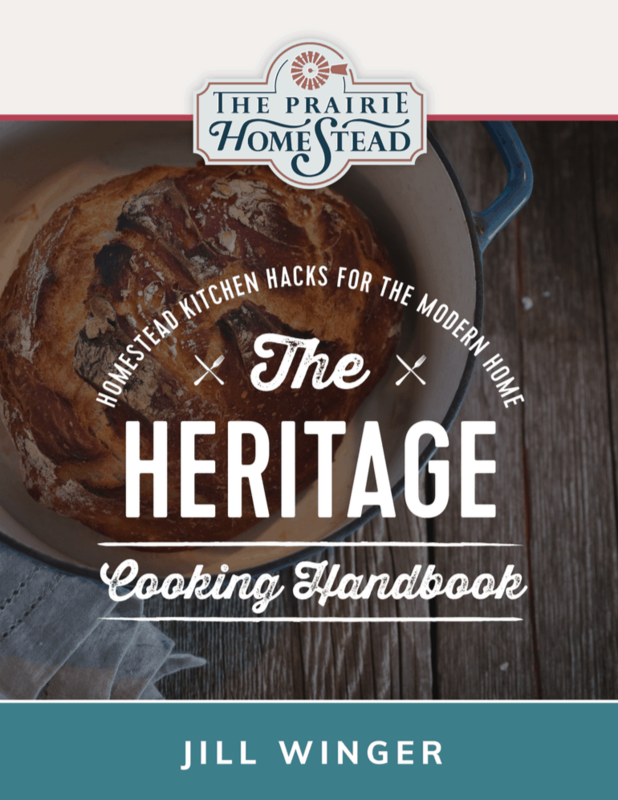 We love using it–it is so easy and I feel so much better about making it ourselves. Last week we made watermelon sorbet with some left over watermelon. It was so light and refreshing! We will definitely be trying out these yogurt recipes! They all look great! Thank you again! 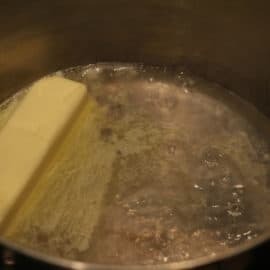 Your recipes look good! I have almost always strained my yogurt before freezing it makes it super thick and not runny at all….sooooo good! Yum! Thanks for sharing the recipes, I can’t wait to try them! I was wondering if you could use honey in the chocolate and strawberry like in the vanilla? It looks like in the “print” version of the recipe you might have meant to increase the sugar rather than decrease in the chocolate recipe? Whoops– yes! Thanks for catching that. I can already taste the chocolate version with some of my homemade peanut butter or store bought defatted peanut flour in it. Yummo! Ok This so isn’t right!!! 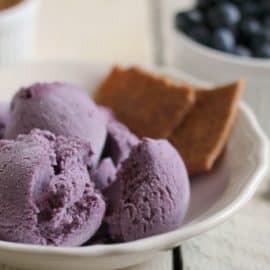 You’ve just found my all time weakness and it doesn’t help that we’ve moved about a month ago and I just found my ice cream maker again:) Will definitely have to try these SOON! I always love your site. Thank you for those mouth watering recipes. I don’t have an ice cream maker but I would surely look into getting one. You are such a good motivator Jill. Thank you! These sound to die for! Ice cream have always been my doubled edged sword usually falling on the sharp edge lol I have always loved it, but while I was pregnant with my beautiful son it was a 4am must have! After having him the MUST have only increased 10 fold with a scary progression 🙂 now its so bad when my fav kind hits 50% off (that has only happened twice in 5 yrs!!!!!) Not only do I have the horrible habbit of making it my main food group because if I don’t I crave it so bad I literally can’t think straight 🙁 I fill my freezer and use whatever space my parents have in thier 2 freezers (the deep freeze broke or I would use that also I’m sure) so obviously I’m hooked! But I desperately need another option for the majority! I am making a huge life change for both my benefit as well as my little one. Going organic as possible, avoiding purchasing pre made (processed items) items avoiding as much man made/lab created foods, meditations, household /beauty/toiletries/all hygiene PRODUCTS. Not just to obviously be much healthier but a better quality of life (and expending extremely useful knknowledge) my son and I both have allergies to everything ( i also have a medical condition that any extra weight I can take off would greatly relieve what’s already grueling pain) other then food that’s very very minimal thank goodness! But to chemicals in general basically everything someone would use to function on the daily or very frequently everyday all the time “normal” harmless?? Products. anyway back to my original reason is there a way to make these great recipes that would really help with my must do healthier lifestyle changes without using ice cream maker?? Even if there was a semi simple recyclable way I needed to make a manul hand turn maker I would do that if necessary 🙂 haha I am going to need such luxuries as a food processor, juicer, and a ice cream maker to keep up with time and production management, but at the moment such things are not possible within my budget. Financially things are always tight another great reason for the huge change of making our own foods and necessities myself! I am excited to have found this site, have just begun to look around I hope to find many more simple great ideas (also budget friendly) very soon. So what would the sugar content be in the chocolate recipe. If I reduce it to 1/3 cup that would be the same amount as the base recipe. Belinda, Don’t decrease the sugar content, follow the recipe. I know because I decreased the sugar and couldn’t even scoop it it was so hard. Sugar, through the process of freezing-point depression, acts as an anti-freeze. 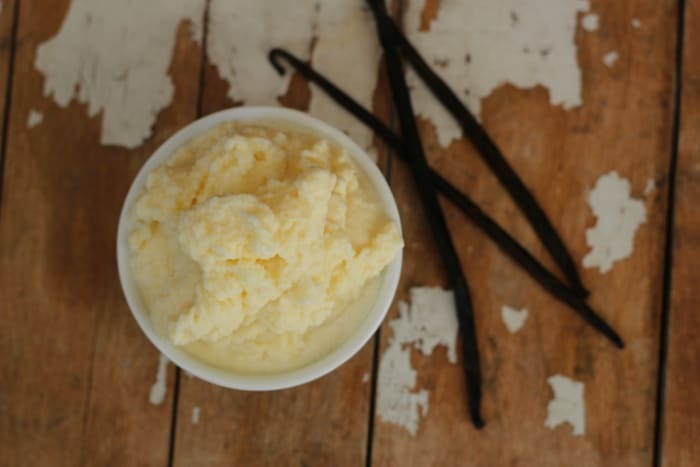 The more sugar that goes into the frozen yoghurt, the softer it will freeze. Worried that the flavour will be too sweet? 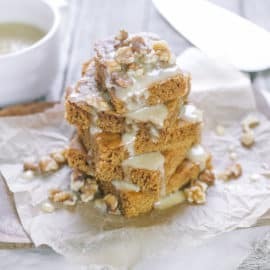 Try adding some inverted sugar (corn syrup, agave nectar, glucose syrup, honey …) instead of your standard caster sugar. 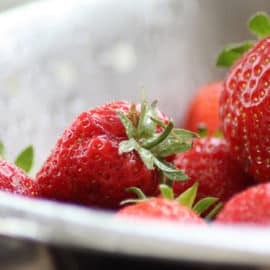 Proportionally speaking, inverted sugars typically act as more powerful freezing-point depressors while not adding quite the same amount of sweetness to the flavour (= more anti-freeze for less flavour-sweetness, in other words). I really like the recipe sweetened with honey. Thank you so much for sharing! I will definitely try these. Also, thank you for sharing your ice cream machine. Ours just broke so we are in the market for a new one. You’re so interesting! I don’t suppose I’ve read through a single thing lik that before. This website is one thing that’s needed on the web, someon with some originality!